It's 1982 and a new home computer graces the scene. Out goes the silent black and white experience and in with 64KB of RAM, colour graphics, and synthesizer sound. Roll forward 35 years and kick nostalgia into overdrive with the release of THE64 MINI. A tiny but perfectly formed officially licensed 50% scale replica of this much loved machine. Featuring high-definition output via HDMI, a classic style joystick and 64 built-in games including classics like California Games, Paradroid, Nebulus, Impossible Mission and Uridium. 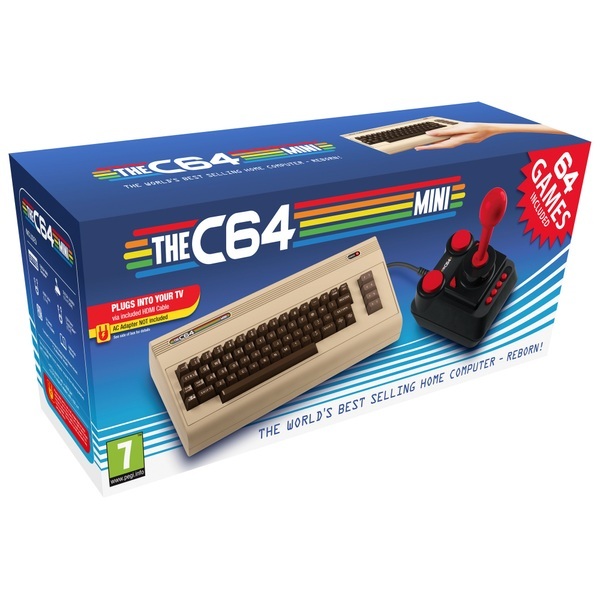 The C64 Mini includes: •	THEC64 Mini Computer* •	THEC64 Joystick (1.5m Cable) •	HDMI Cable (1.2m) •	USB Power Supply Cable** (1.2m) •	64 Games Pre-Installed •	Instruction Manual * Keyboard non-functional. Virtual keyboard feature included. ** AC Adapter NOT included. The use of this mini home computer requires the following devices (not supplied): •	A TV or monitor with an HDMI port. •	a 5V/1A output AC adapter with a USB port. Please make sure to use an AC adater that has been approved for use in your country, and read its instruction manual to ensure that it is able to supply power to this home computer. Retro Games cannot recommend any particular device. AlleyKat, Anarchy, Armalyte: Competition Edition, Avenger, Battle Valley, Boulder Dash, Bounder, California Games, Chip’s Challenge, Confuzion, Creatures, Cyberdyne Warrior, Cybernoid: The Fighting Machine, Cybernoid II: The Revenge, Deflektor, Everyone’s A Wally, Firelord, Gribbly’s Day Out, Hawkeye, Heartland, Herobotix, Highway Encounter, Hunter's Moon, Hysteria, Impossible Mission, Impossible Mission II, IO, Jumpman, Mega Apocalypse, Mission A.D, Monty Mole, Monty on the Run, Nebulus, Netherworld, Nobby the Aardvark, Nodes Of Yesod, Paradroid, Pitstop II, Rana Rama, Robin Of The Wood, Rubicon, Skate Crazy, Skool Daze, Snare, Speedball, Speedball II: Brutal Deluxe, Spindizzy, Star Paws, Steel, Street Sports Baseball, Summer Games II (inc. Summer Games I), SuperCycle, Temple of Apshai Trilogy, The Arc Of Yesod, Thing on a Spring, Thing Bounces Back, Trailblazer, Cosmic Causeway: Trailblazer II, Uchi Mata, Uridium, Who Dares Wins II, Winter Games, World Games, Zynaps.